Vietnam at this time has over 800 agricultural, forestry and seafood products in the market, however only 50 have a Geographical Indication, and 140 have certification marks registered for intellectual property rights. Hilton Hotels & Resorts, Hilton’s (NYSE: HLT) flagship brand, today announced the opening of Hilton Da Nang, a 28-story, 223-room full-service hotel. The opening marks Hilton’s third hotel in the country after Hilton Hanoi Opera and Hilton Garden Inn Hanoi. – The Ministry of Finance is launching a plan to put a tax charge on anyone who buys petrol. Vietnam’s car sales rose by 23 percent year on year in November to 30,540 units, according to a report by the Vietnam Automobile Manufacturers’ Association. Vietnam may grow more than 7 percent in 2018, the highest in 10 years, and is likely to maintain the rate next year, experts say. A United Nations expert has praised the Vietnamese Government and the Government Inspectorate (GI) for their efforts in amending the Anti-Corruption Law. The Ministry of Finance aims to issue VNĐ200 trillion (US$8.78 billion) worth of Government bonds and develop green Government bonds in 2019. Vietnam has given priority to green growth during its economic development, according to Inter Press Service (IPS). The capital city of Hanoi welcomed 5.74 million foreign visitors in 2018, up 16 percent against 2017, among 26 million tourists spending time in the city. The Republic of Korea (RoK) is ready to assist Vietnam in building the capacity of protecting the environment and responding to climate change, and in making relevant laws and regulations. A lack of specific analysis on conflict of interest together with unsubstantial asset declaration challenges Vietnam’s anti-corruption process, expert at the UNODC said. Four cashew processors have been given the right to use the geographical indication (GI) of “Binh Phuoc” for their cashew products, in a move to help them prove the legitimacy of their products originating from the southern cashew hub of Vietnam. The BV 98869 TS fishing vessel rescued 10 foreign sailors and sent them to the Ben Da border post in the southern province of Ba Ria – Vung Tau on December 19, said the provincial Border Guard High Command. The State Treasury of Vietnam has raised more than 11.7 trillion VND (509.1 million USD) from government bonds (G-bonds) during a recent auction at the Hanoi Stock Exchange (HNX). Nguyen Thanh Tien, head of the urban department under Danang People’s Council, said the authorities had invested VND5.2trn (USD222.66m) in three drainage projects in the past 20 years. However, the city’s drainage system is still out-dated and couldn’t cope with the rains on December 9 and 10. The Ministry of Agriculture and Rural Development asked for cooperation from cities and provinces and relevant ministries in preventing illegal transport and smuggling of poultry and cattle into Vietnam. More than 2.34 billion shares of the PetroVietnam Power Corporation (PV Power) will be listed on the Ho Chi Minh Stock Exchange (HoSE) under the code POW on January 14, 2019. The Central Highlands province of Lam Dong plans to build Da Lat into a smart city, and is currently seeking the Government’s assistance in the work. With an export growth rate of 10% annually, farm produce is currently one of Vietnam’s major exports to the European Union (EU). The Vietnam-EU Free Trade Agreement (EVFTA), set to be signed in the near future, is expected to produce a sharp increase in the export turnover of Vietnam’s agricultural products to this market. A programme improving the frequency of helmet wearing amongst children was launched in the central province of Binh Dinh on December 20. A variety of measures to help the Mekong Delta region better respond to climate change and achieve sustainable agricultural production were proposed at a seminar on December 20 in Long An province, part of the third Vietnam Rice Festival. Officials in Da Nang have raised concerns about the increased problems of flooding and environmental issues in the city. Vietnamese platform FastGo is not yet eligible to provide a ride-hailing service, according to the ministries of Industry and Trade and Transport. As Christmas is drawing near, Hanoi’s streets on these days have been filled with the vibrant colours of thousands of Christmas decorations. Vice President Dang Thi Ngoc Thinh on December 20 visited the Committee for Solidarity of Vietnamese Catholics (CSVC) and its Chairman, Priest Tran Xuan Manh, ahead of Christmas. A 360ha urban area will be built in Lương Tài District in the northern province of Bắc Ninh, with an investment capital of more than VNĐ3.6 trillion (US$154 million). – Labour-export companies might be banned from sending Vietnamese workers abroad for jobs considered dangerous. About six million Vietnamese people escaped from poverty between 2012-2016, with the poverty ratio dropping from 15.9 to 9.1 percent during the period, according to a report released on December 19. – Nguyen Thi M (not her real name) made the difficult decision to take her mother to a Hanoi nursing home five months ago. The HCM City People’s Court on Thursday sentenced Trần Phương Bình, former general director and vice chairman of Đông Á Bank’s (DAB) management board, to life in jail on the charges of “abusing power to appropriate assets”, and to 20 years in prison for “intentionally violating regulations on economic management, causing serious consequences”. 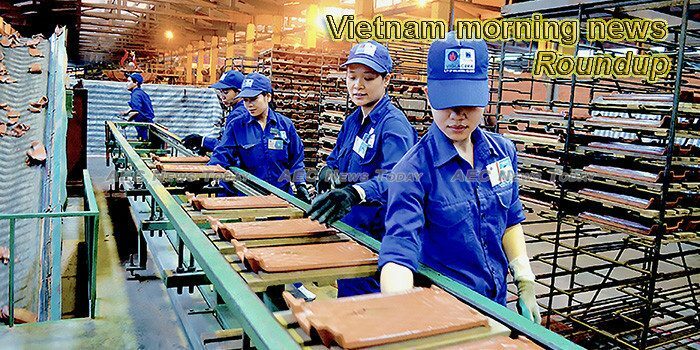 About 70 percent of Japanese investors in Vietnam want to continue investing or expand their investments, meaning Vietnam is an important destination for them, according to a representative of the Japan External Trade Organisation (JETRO). – Multidimensional poverty (MDP) in Vietnam witnessed a significant drop from 15.9 per cent in 2012 to 9.1 per cent in 2016 with some six million people escaping from poverty. The documentary Inside This Peace featuring a forgotten victim of Agent Orange living in Vietnam will be available on Vimeo On Demand across America this Christmas. After decades of being considered to be among the largest rice exporters in the world without a proper brand name, the Ministry of Agriculture and Rural Development has officially a logo for Vietnamese rice brand. – Dao Thi Thanh Binh, a reporter for Thương Hiệu và Công Luận newspaper, was arrested on Wednesday after she tried to extort US$70,000 from a China-invested enterprise in Bac Giang Province. Hoàng Đình Phi, head of the Vân Phong Economic Zone Management Board, spoke to Vietnam News Agency about the mechanisms and policies that have been put in place to attract high-tech investment projects. Vietnam will likely have to face another El Nino spell in the 2018-2019 winter-spring period. Many commercial banks raised deposit interest rates in recent months, triggering worries about the increasing pressure on the lending rates. But some insist this was only a short-term measure. The initial public offering of Vinhomes, the residential realty arm of property and retail giant Vingroup, in May 2018 has been honoured the best share issuance deal of the year in Asia and Vietnam by overseas media. National Assembly Chairwoman Nguyen Thi Kim Ngan extended Christmas greetings to the Catholic community while visiting the Catholic Diocese of Xuan Loc in the southern province of Dong Nai on December 19.